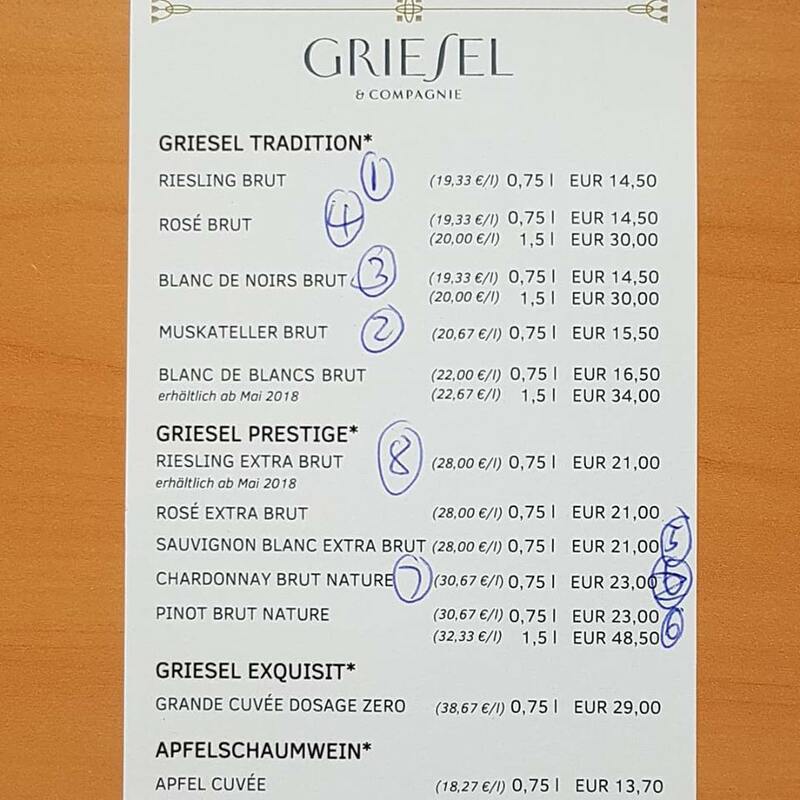 The first stop of the 2018 Germany-South/ Alsace wine tour of ombiasy WineTours was in Bensheim, about an hour south of Frankfurt by car, at an up-and-coming Sekt producer, Griesel&Compagnie, Sekthaus Streit. méthode traditionnelle, like Champagne. We visited a producer of ultra-premium sparklers, Griesel&Compagnie, Sekthaus Streit. Charming Assistant Winemaker Rachele Crosara was our host. 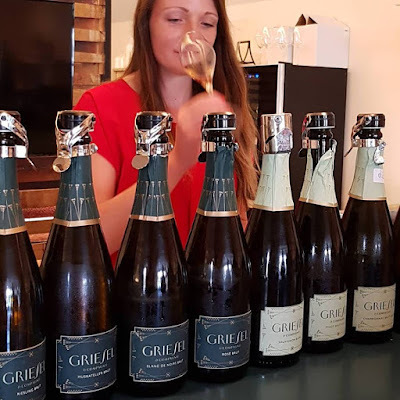 We toured the cellar and had a tasting of the Griesel Sekt Portfolio. Griesel&Compagnie, Sekthaus Streit came into existence just a few years ago and already enjoys the highest accolades. In 2013 the Eberbach Abbey winery in Bensheim moved the production to headquartes in the Rheingau and the wonderful old, vaulted cellers under the Griesel mountain became available. Sekthaus Griesel came into existence. Vintner Niko Brandner started from scratch and could configure the Sekthaus exactly according to his knowledge and ideas. Thanks Rachele for a wonderful visit and tasting. His wines are imported by Skurnik Wines, an importer and distributor of fine wines based in Syosset, New York. Terry also imports Austrian wine and Champagnes, including excellent grower Champagnes. A few comments. First, today red wines account for 1/3 of the German wine output. While Terry has been focusing on the other 2/3 of the German wine output - white wines - for a long time, he has started to include reds in the portfolio as well. 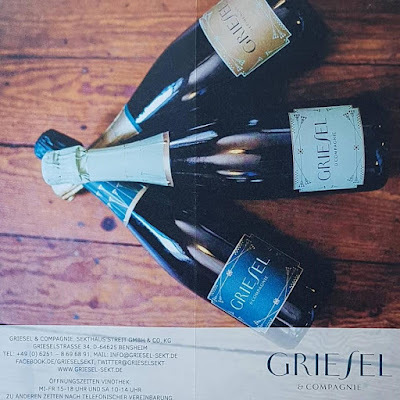 Second, there are no sparkling wines; for sparklers, you have to go to his excellent portfolio of Champagnes, including many Grower Champagnes. Third, his list does not include any noble-sweet wines (Beerenauslese, Trockenbeerenauslese, Eiswein). Fourth, as far as Germany is concerned, Terry has been known for liking sweet-style wines, although his portfolio increasingly includes also dry wines. In fact, the German portfolio has developed a huge selection of dry wines now. Fifth, as mentioned above, this is not a list based on a comprehensive review of German wine, but is limited to Terry Theise’s portfolio of winemakers, which is large and exceptional. My wife Annette Schiller organizes wine tours to Germany (This year: 3 tours – Germany-North, Germany-South and Germany-East). Many of the winemakers we have visited or will visit this year, are represented in the US by Terry Theise: Diel, Dönnhoff, Spreitzer, Von Winning, Kruger-Rumpf, Künstler, Selbach-Oster, Müller-Catoir, etc. I have added pictures from some of these visits, including references to relevant postings on schiller-wine. Picture: Deputy Managing Director Andreas Hütwohl of Weingut Von Winning, Pfalz, with Annette Schillerat the 2017 Rieslingfeier in New York. See: The Annual "Slaughterhouse" Riesling Feast in New York: Rieslingfeier 2017, USA. Here is Terry Theise in o-tone. After an early Spring that was too-warm too-soon, everyone worried about late frosts. And then came late frosts. Before the end of April, nearly all of northern Europe was affected, and the damage ranged from substantial to devastating. Germany was not spared. Crop losses ranged from 25-30% to nearly 60% in the worst instances. Yet there was a curious phenomenon of second-growth (which the Germans call Verrieseln) which, while somewhat reassuring in terms of yields, made for some confusion later on because the second-growth grape bunches could not be eyeball- distinguished from the original bunches. “We really had not one but two vintages,” said Cornelius Dönnhoff, with parallel bunches ripening around two weeks apart from one another. Frost was universal, but different regions (and even places within regions) also contended with hail and with untimely botrytis, including one luckless corner which suffered a late-August hail storm which brought mildews in its wake. It was not an easy vintage! But it is a good one, at times a very good one, and at times perhaps a great one, which we will know in the fullness of time. Low yields correspond to high extract, and certainly a lot of the growers were pleased with the readings. (Extract gives a mid-palate umami that registers as density, stuffed-ness, like a suitcase you have to sit upon in order to shut.) The more candid growers pointed out that botrytis (and excessive moisture) could also create high extracts, and the warning was apt. 2017 isn’t a vintage you can “read” from a lab analysis. You have to taste. And what do you taste? After the nearly perfect lissome and sleek 2016s, 2017 is a marked contrast; it is a serious tasting vintage, by no means unfriendly, but levity does not obtrude upon it. There are certainly some charming wines, and there are loads of delicious wines, but ’17 is a vintage of dark character whereas ’16 was lyric and bright. “Dark” can be construed either metaphorically or in some cases almost literally – ’17 has an iron-like cast, almost always smoky, like burning vine shoots. I used “shoot-smoke” quite often in my notes, and I surprised myself by writing “peppery” from time to time. Compared to the mischievous ‘16s, the new vintage seems a little earnest. But if you’re a serious kind of person (and a taster who appreciates no-nonsense wines) you’ll be richly pleased by these 2017s. And there are many, many wines that everyone will flip over. The vintage was gathered early almost everywhere, but the Pfalz was really early: Many were finished by the first few days of October (about 3-4 weeks ahead of schedule), and what they gathered should make them very very happy. If 2017 is potentially great anywhere, it’s in the Pfalz. Three of my producers showed me the best collections I’d ever tasted – Meßmer, Eugen Müller and Darting (and forget any notion you harbored that Darting makes fun little wines, because these ‘17s are lysergic), while another one presented a grand and unusual collection (Catoir! ), while our pals at Von Winning continue their orbit around the Van Allen Belts (and the “GGs” won’t be offered until January 2019, and may be the best they’ve ever made…), and finally my beloved Minges made the excellent vintage they always make, only unusual in the 2017 context where everyone reached new levels whereas Theo and Regine “merely” maintained their prevailing and consistently superb level. In any case, the smart money says to allocate more of your (mingy and pitiable) German Riesling budget to the Pfalz in 2017. 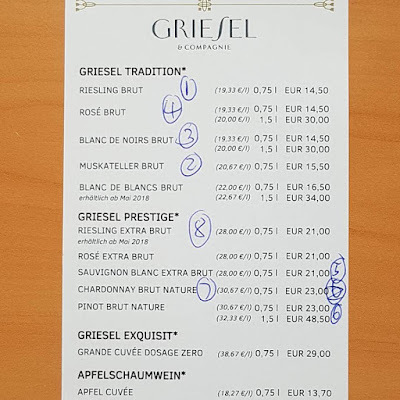 I found excellent wine throughout the Rheingau and Rheinhessen (and tasted from four estates in the latter region, though two were newbies under consideration). If there’s a demarcation in 2017, it follows a frequent vein that divides Mosel and Nahe from regions south and east. The Nahe also varies within itself (as indeed it often does, encompassing so many climate and soil zones) so that you can’t generalize except to say it is always good and sometimes superb. Most fascinating for me, the two great estates (Diel and Dönnhoff) seemed to run counter to the vintage’s prevailing solemnity and made stirringly tender, lapidary wines. Don’t ask me how, or if you do ask me how, be ready for a fusillade of gibberish as I try fruitlessly to explain the inexplicable. And finally to the Mosel. First, the good news: the very best wines I tasted from 2017 were Mosel wines. At times their profundity made me think of great years like 1971 or 2005, and at other times their serenely perfect harmonies stopped me in my tracks and filled me with wonder and gratitude. But, there is also not-so-good news. The Mosel vintage has markedly present acidity. The best growers managed it. The others….did not. At times 2017 – normally a vintage of almost imposing stature and command – seemed rather small at certain Mosel estates. But please be aware, this is my palate speaking, and I have arrived at a point whereby if I notice acidity it’s because it’s too caustic for me. The right acidity is a vibrating but silent partner. The wrong acidity is a sharpness I do not find agreeable – but that’s me, and you may well feel differently. In any case, my colleagues Valerie Masten-Bonné and Gabe Clary all agreed it was a yo-yo sort of year along the silvery Mosel. Even then I was reminded that I have the luxury of tasting only from solid producers, and there is apparently plenty of yucky wine in 2017 – but nothing I tasted was objectionable in that way (except for a few potential newbies whose wines helped me appreciate what I already have…) and such issues as I have with some ‘17s are just my querulous palate throwing a tantrum. If 2016 is a well-told joke, 2017 is a magnificently constructed argument. If 2016 is a morning in Spring, 2017 is an evening in Autumn. The small crop and the weakened Dollar will push prices upward, making the remaining ‘16s quite the bargains. That said, to pay a premium for wines such as the best ‘17s is a reasonable proposition, in view of the sheer concentration of the wines. Bearing in mind, as always, that Selbach-Oster and Dönnhoff are always superlative, and I have struggled how to acknowledge this and still give “emerging talents” a chance. This time I shall attempt another futile means of squaring the circle, for which I invite you to tease me contemptuously, should we ever meet. CARL LOEWEN is the estate with whom I was most profoundly impressed. They not only ascended to a hitherto undreamt-of level, they seemed to have the Midas-touch, as wine-after-wine-after-wine was almost eerily perfect, gorgeously balanced, and poised not with any great assertiveness but instead with a serene gentle perfect-pitch of the purest harmony. Possibly this is the full flowering of the father-son synergy of Karl-Josef and Christoph, and possibly it’s just one of those things. It’s also contrary to my commercial interests, because there isn’t much wine and we won’t be able to entirely fill orders. But credit where it’s due – and it is richly due here! That is first, any estate who have conspicuously exceeded their usual standards, and second, estates presenting a sustained high level of excellence. Spreitzer, for a steady hand over the whole range, and for many high points. Goldatzel, for an almost Nigl-like perfection of focus and expressiveness, over and over, to the point it almost physically hurt to leave any wine behind. Diel, for perhaps the first vintage where Caroline’s influence can be tangibly felt. The wines seem to be entering a new era of finesse and a quality I can only describe as melting, yielding, swooning. Darting, who showed me simply their best-ever vintage, at least two levels above anything they’ve produced to date. Von Winning, with the caveat that we can’t yet place the GGs into the mix as they can’t be offered before 2019. And yet, if we did…. Meßmer, my “vanity project” has made their best vintage in Gregor’s era. He himself concurs, and he is self-critical like few others I know. Müller-Catoir, for a new departure in style or syntax, and for an insanely good group of Scheurebes. If one isn’t only taking 2017s into account, estates offering earlier vintages would lunge toward the top. Thus credit where it’s due, to Künstler and Breuer, for wonderful collections across vintages and colors. 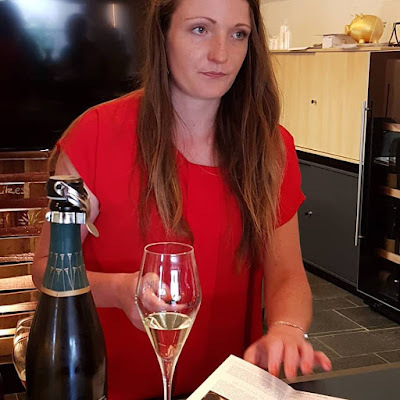 Loewen – 1896 Riesling Feinherb (if you don’t want to be able to get any), and…..
Selbach-Oster – Zeltinger Schlossberg Riesling Spätlese (if you wish to actually have access to some). This category is being retired, as I have included the Trockens among the general scrum of great wines, where they now belong. Selbach-Oster also has TWO, the Graacher Domprobst Riesling Alte Reben Feinherb and the Zeltinger Sonnenuhr Uralte Reben Feinherb. Darting also shows us TWO: the 2017 Pinot Blanc Kabinett Trocken, and the 2017 Riesling Kabinett in LITERS. Meßmer the Riesling Feinherb in LITERS is the best he’s ever made, and three levels above any class existing before.